It's always been said that pregnant women have some strange culinary cravings. A new study suggests that it is acceptable to wash all the pickles and strawberry ice cream down with something stronger that apple juice. The latest Journal of Epidemiology and Community Health published results of a study that followed 18,500 children between 2000 and 2002 who were born to mothers who consumed alcohol during pregnancy. 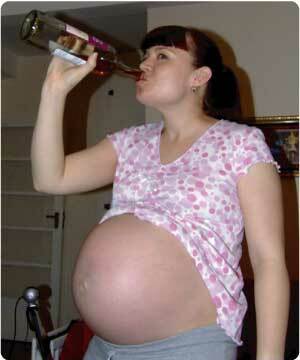 The study found that there is no evidence that one or two alcoholic drinks a week while pregnant will harm a fetus. In fact, tests given to children of women who drank moderately while pregnant revealed surprising results. The tests, measuring the emotional and intellectual progress at 9 months, 3 years, and 5 years of age, found that "brains by beer" babies scored much higher in the tests than babies born to mothers who never consumed alcohol, pregnant or not. The results stayed the same at the 3 and 5 year mark. One can only imagine how advanced our world will become when these kids are in charge someday! For some strange reason, the "drink" size for beer was measured at 8 oz. Hopefully, the beer was a nice Imperial Stout. If you only get to drink half a pint, you moms-to-be have to make it something good. Your future child is counting on you! Like Kids in a Candy Store! My Goodness! My Guinness is Expensive!